It would be idealistic to say that the DP Level Transmitters can always be located at the exact the bottom of the vessel where we are measuring fluid level in. Hence, the measuring system has to consider the hydrostatic pressure of the fluid in the sensing lines themselves. This leads to two compensations required. In some cases, it is not possible to mount the level transmitter right at the base level of the tank. Say for maintenance purposes, the level transmitter has to be mounted X meters below the base of an open tank as shown in below figure. That is, the pressure on the high-pressure side is always higher than the actual pressure exerted by the liquid column in the tank (by a value of S⋅ X). This constant pressure would cause an output signal that is higher than 4 mA when the tank is empty and above 20 mA when it is full. The transmitter has to be negatively biased by a value of -S⋅ X so that the output of the transmitter is proportional to the tank level (S⋅H) only. This procedure is called Zero Suppression and it can be done during calibration of the transmitter. 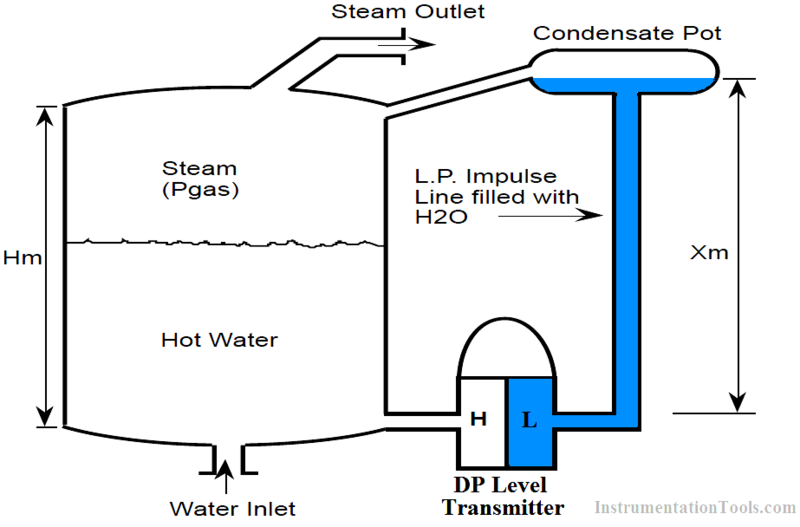 When a wet leg installation is used (see below Figure), the low-pressure side of the level transmitter will always experience a higher pressure than the high-pressure side. This is due to the fact that the height of the wet leg (X) is always equal to or greater than the maximum height of the liquid column (H) inside the tank. The differential pressure ΔP sensed by the transmitter is always a negative number (i.e., low pressure side is at a higher pressure than high pressure side). ΔP increases from P = -S⋅ X to P = -S (X-H) as the tank level rises from 0% to 100%. If the transmitter were not calibrated for this constant negative error (-S⋅ X), the transmitter output would read low at all times. To properly calibrate the transmitter, a positive bias (+S⋅ X) is needed to elevate the transmitter output. This positive biasing technique is called zero elevation. 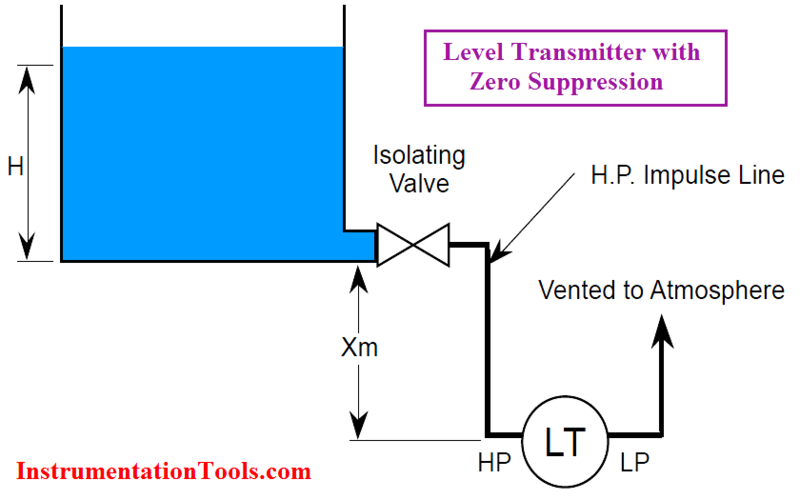 I had referred modules of level transmitter & i can’t understand a particular line that “LP side posses higher pressure higher than HP side”, then how can we say that side as low pressure side. Ya well I got it.